Two life-long visionaries who were instrumental in building some of Nebraska’s most treasured pathways were named Rails-to-Trails Conservancy’s (RTC’s) 2017 Doppelt Family Rail-Trail Champions. Many across Nebraska credit Ross Greathouse and Lynn Lightner – who have been friends and fellow trail builders for nearly four decades, and who are avid runners and cyclists – with laying the early groundwork for the Nebraska Trails Foundation and for playing significant roles in fundraising for and completing most of the trails now supported by the foundation. Greathouse and Lightner were honored Feb. 8 for their work on Nebraska’s trails at a private ceremony sponsored by RTC at the Jayne Snyder Trails Center. To date, Lightner has overseen the construction of 40 trail bridges and 30 volunteer work crews, and his work extends to Iowa, where he helped raise money and complete a bridge on the Wabash Trace Nature Trail, part of RTC’s national Rail-Trail Hall of Fame. Greathouse estimates having raised $2.5 million for trails, and has also contributed to planning major trails and networks such as the 219.3-mile Cowboy Trail, which has been decades in the making and will stretch more than 321 miles when complete; and the Quad-State Trail and Missouri Statewide Trails Plan, an extensive trail system in Nebraska, Kansas, Missouri and Iowa. Both men point to the recently completed 22.9-mile Chief Standing Bear Trail, which now spans from Beatrice to the Nebraska-Kansas border, as their greatest accomplishment. Named after the Ponca Tribe’s legendary leader, Chief Standing Bear, the trail serves as a lasting landmark for the tribe and its history and has been a project in the making for 25 years. Lightner and Greathouse helped facilitate the transfer of ownership of 19.5 miles of the trail to the tribe in May 2017. To honor their achievements, RTC and the Doppelt family are making a gift in their name to the Homestead Conservation and Trails Association for the Chief Standing Bear Trail. Since 2011, the Doppelt Family Rail-Trail Champions Award has honored more than 30 individuals around the nation who have made significant contributions to the rail-trail movement through their hard work, volunteerism and support – in short, those who have gone above and beyond in the name of trails. To learn more about the life-long contributions of Greathouse and Lightner and the Doppelt Family Rail-Trail Champion Award, visit railstotrails.org/trailblog. Rails-to-Trails Conservancy is the nation’s largest trails organization – with a grassroots community more than 1 million strong – dedicated to connecting people and communities by creating a nationwide network of public trails, many from former rail lines. Connect with RTC at railstotrails.org and @railstotrails on Facebook, Twitter and Instagram. 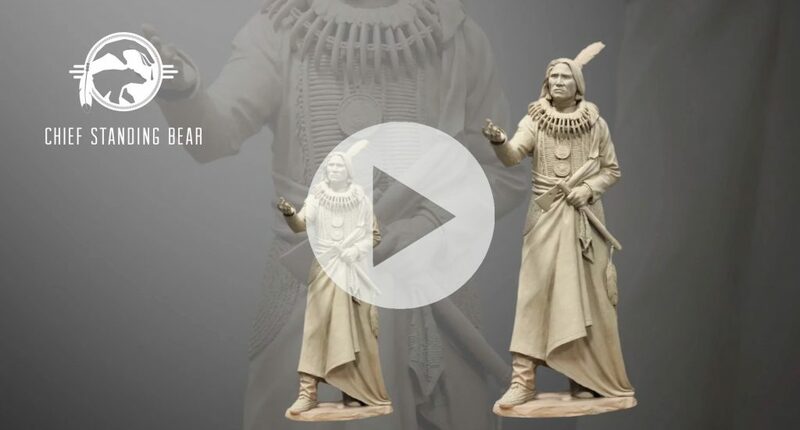 CHIEF STANDING BEAR MAQUETTES NOW ON SALE! Watch our video to learn about the legacy of this historic figure or click here for more information.